I am trying to make my company green and I stumbled across these folks on the internet. I ordered a bunch of these bags for my store, all my customers use them all the time. Neoprene is a very durable material, it also works well as a insulator. I have been in the wine industry for 13 years and have been through many reusable wine tote bags. I prefer to use the neoprene material for all of our reusable totes for its durability and the print quality on the material. It also has its benefits for white wines for its ability to stay chilled within the bag. I suggest using this bag as your company's wine tote bag for these reasons. Really durable and long-lasting product!! These bags are great I highly recommend ordering them. I love the compact size of these bags! They look so good! Our bags are so nice! So attention grabbing! Our bags are so attractive! Perfect for promoting. Really durable wine tote, we will be ordering this wine tote bag again for our next wine tasting. The bottom is flat so you dont have to worry about the bag falling over. I have ordered neo prene products before and was wondering how well the bottle would stand up in the bag with it being made of neoprene. But it is flat it is a non issue. Overall the bag is great, neo prene is a strong lasting material and it will last a long time through each reuse. 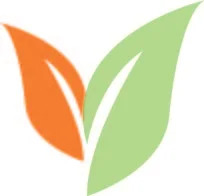 Super easy website, environmentally friendly products and there staff is really awesome to deal with. I advise ordering this bag from them. We just threw a huge 100 year anniversary party for our company and handed this out as a gift. It was really cool working with custom earth promos, I hope to use them again for another project. Such a high quality product! Our bags look so great. My bags are so cute! Our clients can't get over them! These are perfect for our companies promotional needs! Thank you CEP! Well made bag for the price. The quality was consistent throughout the whole order as well. I love the style of this bag it is very affordable for a nice looking single bottle reusable wine tote. Good price for a large quantity all my customers love them and reuse them just like they are intended too. Looking forward to our next project!! This neoprene wine tote came out amazing!! Thanks guys! We ordered this bag and some of the larger reusable recycled bags they sell. Both products came out great. I just uploaded my graphic to be printed on the bag and placed my order, very easy and stress free. Our bar uses this reusable bag to package to go bottles when a client is done for the night. It is a promotional advertising item that we take on as a cost which is not much considering how much our clients reuse them. I suggest idea this to all bar owners. Durable material, good insulator for chilled bottles, also water does not effect the material. If you're looking for a new eco-friendly option to promote your company brand, glance at our Jute 2 Bottle Wine Bags! 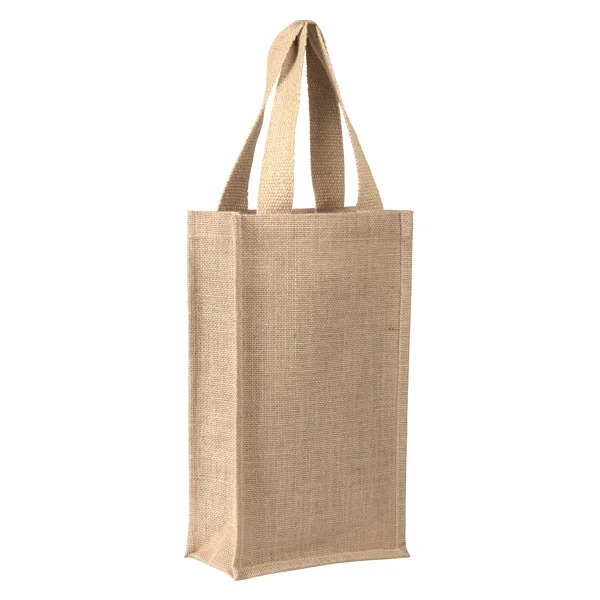 Made of 100% recyclable and reusable material, this jute tote is perfect for promoting to the eco-aware and the wine lovers. Printing your business message across the front of our bag will contrast against the natural tan color, making your brand pop! 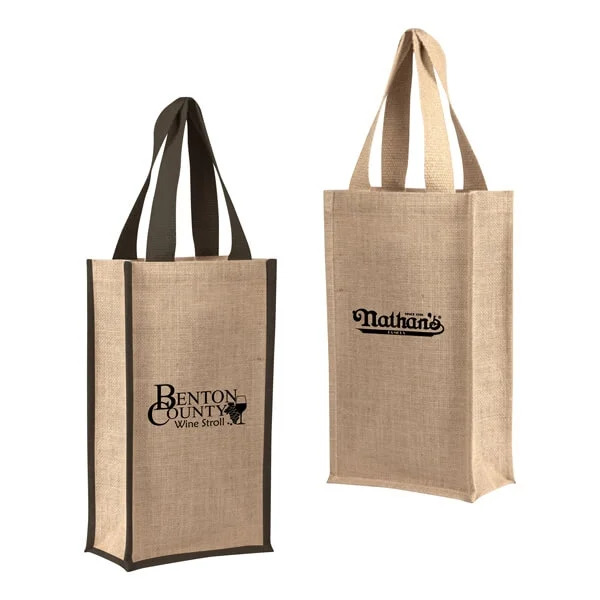 Custom Earth Promo's Jute 2 Bottle Wine Bag is one of your best options for reaching your target market! Perfect for carrying around two bottles of wine and even better for promoting your brand with an eco-friendly twist! Comfortable cotton handles allow for the best carrying capabilities, not straining your hands or shoulders. Lastly, the 4.5" W x 7" H imprint space allows for your business to use all of the space for your brand logo. Made with 100% biodegradable and recycled materials, our Jute 2 Bottle Wine Bag is made for dazzling your eco-friendly and target markets! The bag's durability and strong material make it a great addition to any on-the-go wine enthusiast, not matter how heavy its contents. Your company can take full advantage of the imprint size options and make this bag a great promotional tool! Purchasing this bag will show your customers your eco-integrity, but also your stylishness and versatility! This promotional bag can be used for grocery trips or a trip to the local winery, gaining you a unique new audience. Custom Earth Promos is devoted to getting their customers the product they want, that works for you and gets to you on time. Working with an overseas manufacturing facility, we are able to produce the product and get it to you on time for your business and promotional needs!